Extract from Living with Flowers: Blooms & Bouquets for the Home by Rowan Blossom, published by Laurence King. Available at www.laurenceking.com and at all good bookshops. RRP £19.99. The beauty of arranging flowers in this way is that they will look informal, by the very nature of the vessels – washed-out old bottles and jam jars, with the odd pretty bud vase picked up along the way. I got most of mine from Golborne or Kempton markets or charity shops on my travels. I do find it hard to resist a rummage in a charity shop – you never know what treasures you might discover! I love dotting these dinky arrangements around the flat, on the entrance table where I leave my keys, maybe one by the soap in the kitchen so there’s something pretty to look at when I’m doing the washing up, or clustered on the kitchen table for a casual centrepiece. The informality of this arrangement, and the fact that you don’t need loads of flowers, means that you could quickly rustle up a display with a couple of bunches from your local florist or supermarket, or, if you’re lucky enough to have a garden, snippets of homegrown blooms. Selection of bottles, jam jars and bud vases. I like having different heights, shapes and sizes, but work with what you have – old or new, as long as they can hold water they will do the job. 1. Gather your bottles, jam jars and bud vases and fill them three-quarters with cold water. Start by adding a sprig or two of foliage to each vessel, varying the height and type. 2. I always start by adding the tallest flowers. These will give a lightness to the arrangements, so keep the length where possible (even if it initially looks absurd). Next add the babes, the big-headed flowers. Keep some tall and cut some super-short so the heads just peep out. 3. Now go in with your dainty, wispy flourishes. Here the twisty curlicues of sweet-pea tendrils give a relaxed feel to the assortment. Available at www.laurenceking.com and at all good bookshops. RRP £19.99. Extract from My Bedroom is an Office & Other Interior Design Dilemmas by Joanna Thornhill, published by Laurence King Publishing. They say rules were made to be broken, but in order to do that, you must know them in the first place. Here are five common interior design truisms, and how to interpret them to make them work for you. 1. They say: Follow the 60/30/10 rule when choosing colours. Sixty per cent of the room should contain the dominant colour and thirty per cent the secondary colour, leaving ten per cent for accent pieces. We say: Loosely following this makes sense since going all-out colour crazy can result in a frenetic, disjointed feel, especially if you’re not sure what you’re doing – but don’t let it bog you down. Sometimes the most successful schemes are those that incorporate ‘a little bit of wrong’, which actually gives depth and soul to a space. 2. They say: Use symmetry to create a balanced space. We say: It’s true that our brains are programmed to find symmetry pleasing, even therapeutic. But too much of it in a small space can feel bland and dull, and possibly even overwhelming. Try using a symmetrical approach with key elements or focal points – a circular table directly in the centre of a square room, for example – but break it up with an off-centre sideboard or ornaments arranged together in odd numbers. 3. They say: Decorate with natural colours. We say: Mother Nature is not to be trifled with, and she certainly knows what she’s doing, though ‘natural’ certainly needn’t mean neutral. Look at the way she balances hues and proportions (in fact, we think she might be following the 60/30/10 rule), whether it’s in the sombre, muted tones of a stormy sky or the vibrant, unexpected contrasts of a bird of paradise. 4. They say: Choose furniture and flooring that are proportionate to the size of the room. We say: Common wisdom might dictate that the smaller the room, the more diminutive the objects you should put in it, but in fact this can create a cluttered, broken look. 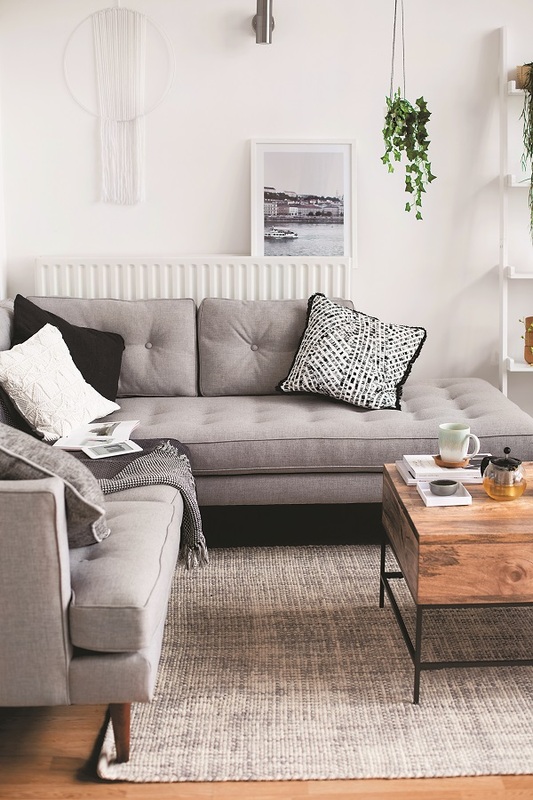 Think less, but bigger: go bold and choose a show-stopping L-shaped sofa over a two-seater and armchairs to act as a bold and inviting focal point, for example. The same rule can be applied to flooring, using largeformat tiles or wide planks. 5. They say: Stick to white or light tones in a small space. We say: While white seems an obvious choice – it reflects light and brightens dark corners – there’s also a danger that it will feel bland, and if there’s not enough to attract the eye the space will ultimately still look small (albeit pale). A vibrant hue might not be to everyone’s taste, but it can give a luxurious jewellery-box vibe, while dark tones add atmosphere and mood as well as highlighting interesting architectural details, creating an inviting sanctuary. Available at www.laurenceking.com, RRP £14.99. Extract from Wonder Plants 2 - Your Urban Jungle Interior, by Irene Schampaert and Judith Baehner. Published by Lannoo. In the greener part of the city of Baltimore, near the Hampden district along the banks of the Jones Falls River, an old cotton factory from 1870 was transformed into a luxury apartment complex. Today, it is more commonly known as Cotton Mill N°1. Hilton Carter, filmmaker, producer, and an interior decorator and plant specialist in his own right, found his dream loft there. And, to be sure, spending time successfully, as it resulted in beautiful arrangements throughout the apartment. The test-tubes wall is just one of the many eye-catchers. That’s precisely where all the new plants come to life: a solution for cutting plants that is as original as it is decorative. It’s another one of Hilton’s hobbies that has widely spread its roots. That the Carter home abides by a tight schedule to care for the nearly 150 plants – yes, they have indeed been counted - should not come as a surprise. “A basic knowledge of the different plants is vital,” Hilton says. “Each plant comes with its own needs and its own specific treatment. I set my alarm so I know precisely when to water which plants.” And then it is just a matter of following your gut instincts. You can get quite far with tender loving care. Rest assured, even I lose the occasional soldier,” he jokes. It happens to the best of us. This is an extract from Homes with Soul: Designing with Heart by Orly Roninzon, published by Images Publishing. In recent years, awareness that the power of design affects our emotional, psychological, and social wellbeing has notably surged. Design has become an integral part of life's basic needs, even aspirations. These days, people all over the world are mindful of the power design has via social networks, from the flow of images bursting from apps, websites, magazines, and books into the mobile phones in the palms of our hands. Bring nature home, and natural sunlight gently washes the interiors, softens, and in streams a pleasant breeze. The natural appearance is honest and heartfelt. This influx is tremendous and inspiring, and calls us to action. People wish to live a more aesthetic life, whether it is relating to fashion or home design. I believe in the power of styling and appreciate its merits. I see how using a lightweight carpet, some pillows, and curtains on a very reasonable budget completely transforms a room's appearance. How, by simply organising and cleaning the house, using a fragrant floor detergent, one can enhance its look and feel. The homey smell of laundry, cooking or baking, and fresh flowers never fails to create a pleasant ambiance at home. Anything is possible and we are all encouraged to enter the world of affordable design. I refer to things you can do on your own on a small budget: updating and painting furniture pieces, creating personal art, showcasing collections, displaying family photographs, expressing your creativity, and believing that, just like getting fit, the beginning requires effort, but once we are fit, we feel great. The power of home dressing is potent. It is choosing the dark tone of the armchair, the one that household members particularly love, the compels them to curl up, feel wrapped and protected. So it is also the case with design. The more open your eyes, mind, and heart are, the more aware you will become of the decorative aspects of your home, the more opportunities will reveal themselves to you. Is there such a thing as a bed that is too indulgent? We need a good, deep, and blessed sleep. The power of styling: remember to use it. Fashion experts often talk about the aspirational capsule wardrobe. Why not a capsule shelfie wardrobe, too? It gives you a go-to collection for all your shelfie requirements. If you’ve collated objects you love, you should find that they work together harmoniously – a bit like a melodious choir. Of course, you will no doubt add to these as time goes by – with ad hoc additions such as children’s artwork or a birthday gift – but the shelfie capsule wardrobe should give you years of good service. This shelfie (above) in my home contains my entire “capsule shelfie wardrobe”, including vases, candlesticks, heirlooms, books, baubles, ribbons and braid, as well as a memory box. The colours are set off by cut-out artwork by Antonia Woodgate and my favourite multicoloured “Happy Happy” canvas by artist Dan Baldwin, which helps the shelfie arrangement to “sing”. My style guru is the inimitable Iris Apfel, nonagenarian interior designer and fashion icon. I love how she mixes colour, pattern and texture with unabashed confidence. As quoted in the Telegraph in 2011: “I mix everything up. A museum curator once said to me that there is a great jazz component to the way I do things because good jazz is improvisation and draws elements from all different cultures”. Curating doesn’t mean buying everything that matches. In fact, it often means having the confidence to buy something because it doesn’t. Mix it up like Iris does. Thrift shops: Get managers on your side. They have an overview of what’s come in and have the discretion to let you know about it. Auction and craft websites: Search these for original artwork and objects. Specialist shops: Plunder everything from button shops to a fly-fishing shop for neon floats. Vacations and day trips: Whether it’s a shell or a bracelet, holiday finds can add both visual excitement and emotional connection. Published by Mitchell Beazley, £12.99. Extract from Get it Together - An Interior Designer's Guide to Creating Your Best Life by Orlando Soria. Published by Prestel Publishing. A space doesn’t seem quite right when it’s filled only with brand-new furnishings. For me a home doesn’t feel done until there are some vintage items present. Why? I think it’s because vintage furniture and accessories bring a history and age with them that is impossible to replicate, even with the best faux finishing on earth. Objects and furniture have the same type of inexplicable powers of attraction. Vintage pieces, much like vintage homes, give off a historic presence that gives your home a warmth and complexity that new objects cannot. I like to balance vintage pieces with newer items to make sure the space feels full of character but also fresh. But many people find vintage shopping to be totally daunting and overwhelming. Below are my tips for finding the best vintage pieces. There are a lot of gorgeous showrooms that sell only the best vintage treasures. If I could afford to shop only in those places, I would. But for someone getting started in the vintage game, I’d stick to thrift shops and flea markets. There’s a Goodwill down the street from me that I go in almost every time I pass it. Eight out of ten times I find nothing, but occasionally I find something amazing. It’s a constant search. I still love going into high-end vintage and antique dealers, both for inspiration and on the off chance I can afford something in there. The more you spend on something, the more of a commitment it is. So dipping your feet in the thrift store/flea market pool is an unintimidating way to get started collecting vintage. When shopping, sometimes you don’t know if you love something until hours later. But if it’s a flea market that may mean it’s too late. I tend to think that if you find yourself attracted to something, you should follow your instincts. I’ve had so many traumatic experiences at flea markets where I second-guessed myself only to realize later I passed up something awesome I totally should have snatched up. Usually your first impression of something is correct. The tough part about vintage is there’s a thin line between things that are awesome and things that are just tacky and gross. The easiest way to figure out if a vintage object is cool or disgusting is to imagine it styled on a bookcase with a stylish combination of new and old items. If it seems like something that will look great next to a bunch of other pieces, it’s probably awesome. If it looks like it’s gonna stick out like a sore thumb, it’s probably not a good buy. Take, for example, this little wooden duck bowl (above). It’s definitely weird, but when placed on a stack of books, on an elegant dresser, its quirkiness creates the perfect contrast to the sophisticated things surrounding it. While art from galleries and high-end boutiques can be very expensive, sourcing vintage art from thrift stores is a great way to grow your collection. While you might not be buying art by megafamous artists, this is a great way to find beautiful, handmade items that add personality to your home. When I found this wooden bird candelabra (previous spread) at a thrift store, his beak had broken off and he was sad and all alone. So I paid the $4.99 he cost, took him home, and made a new nose for him (by filing a wooden dowel down using a pencil sharpener). If something is amazing and unique, it’s worth a little effort to restore it. My ex-boyfriend and I found these two different busts (above) at a flea market and I knew immediately that they were meant to be together. I was so committed to their pairing that I gave them to him when I moved out because I couldn’t bear to see them separated. When planning what pieces you want to pair, think about mixing materials and making sure they are different heights (when grouping things it’s usually a good idea to make sure objects are different heights). Pieces like dressers, side tables, coffee tables, and other non-upholstered items can be found at flea markets and thrift stores at great prices. I exclude upholstered items here because they often need to be reupholstered, which can add significantly to their cost. Most of the dressers I’ve ever bought have been vintage. If they’re made out of quality wood and have been well taken care of, they’ll last forever. Adding a frame to a painting on panel (such as the portrait featured above) is a great way to step it up. Many inexpensive artworks come on flat canvas panels or wood, which can look junky unframed. A frame with some heft adds to their visual presence and makes them look like a million bucks! Photographs by ©️ Zeke Ruelas. Extract from Perfect English Townhouse by Ros Byam Shaw, published by Ryland Peters & Small. A new staircase, leading from one of the two front doors, arrives at a small landing where this door with its glazed surround opens into the huge 18 metre living room and kitchen. Framed in a glass-fronted cabinet on the wall are fragments of china and pottery found by Melanie on the beach. Melanie and Martin inherited a fitted kitchen that was already in place, but have given it a facelift by painting it Farrow & Ball Mole's Breath and replacing the handles. New white brick tiling, open shelving, and a wall-mounted metal saucepan rack completed the transformation. A sofa covered in navy linen, just seen to the left, marks the division between the kitchen and the sitting room. To the left of the big, arched window that lights the kitchen, a table holds a framed pressed seaweed by Molesworth & Bird propped against an old seed tray, another find from Bridport Market. To its right is a painted Swedish sofa. A broken piece of brick, deliberately placed, takes on the status of a small sculpture. Lou-Lou the cat watches proceedings from under the table. The huge sofa, big enough to seat six, came with the house, and has been re-covered in a dark grey linen. A white IKEA table stands between the two armchairs, one covered in a floral fabric by Paul Smith for Mulberry. The window overlooks the culvert for the River Lym, which runs beneath part of the house. The main bedroom is one of the rooms directly above the River Lym, which runs in a deep culvert down through the town and into the sea. The Victorian chair is covered in vintage William Morris fabric, and the table beneath the window has one set of legs propped on blocks of wood to compensate for the slope of the old floorboards. This is an extract from Decorate - 1,000 inspirational design ideas for every room in you house, by Holly Becker and Joanna Copestick. Published by Jacqui Small. Colour is one of the most powerful of decorators’ tools. Relatively economical to use, fun to choose but also easy to get wrong, so some experimentation is a good idea. Pale pink linen walls in Christine d’Ornano’s London home are subtle but hugely warming. Some colours will change character according to how they are used. A gloss grey will be colder than a chalky paint, while blue can bear to be shiny as well as matt. For instant impact paint one wall in a living room or bedroom in a bold, vivid colour. Choose the wall that will make the most dramatic statement. In a large room where you want to enhance a sense of enclosure and seclusion, opposing walls can be painted the same colour. Combining a range of tones in one colourway makes a sophisticated statement. Minky, mole-like browns and soft cappuccinos on a range of fabrics and textures in a bedroom presents an enticing picture. You can add highly patterned wallpaper to one wall to create a feature in a room where there is no natural focal point. In a room dominated by neutral colours add in vivid contrast colour as accents on upholstery, cushions or artwork. Strong tones such as orange, citrus lime or red work well as vivid jolts of colour in this way. Small sky blue mosaic tiles give a mother-of-pearl shimmer as they catch the light above a simple fireplace. Tiling is a good way of adding colour to kitchens, living room and bedroom fireplaces and bathrooms. Infusing a room with bold colour is one of the best decorating tools to create an instant mood or a certain style. Think warm blues, hot pinks or sunshine yellows. They will all create a cosy space in a small room and detract from the room’s natural dimensions. Remember that red will always warm and enclose while white will always expand and lighten a space. When choosing paint colours, always opt for a shade or two lighter than what you are naturally drawn to. Paint chips often deceive. Apply bold colours midway up a wall to lessen their impact but provide a visual feast when moving from one room to another. Use paint or wallpaper to create the colour and add in complementary tones for punctuation. Steer away from brilliant white paint. It contains a blue caste that will make northern rooms dull and grey. 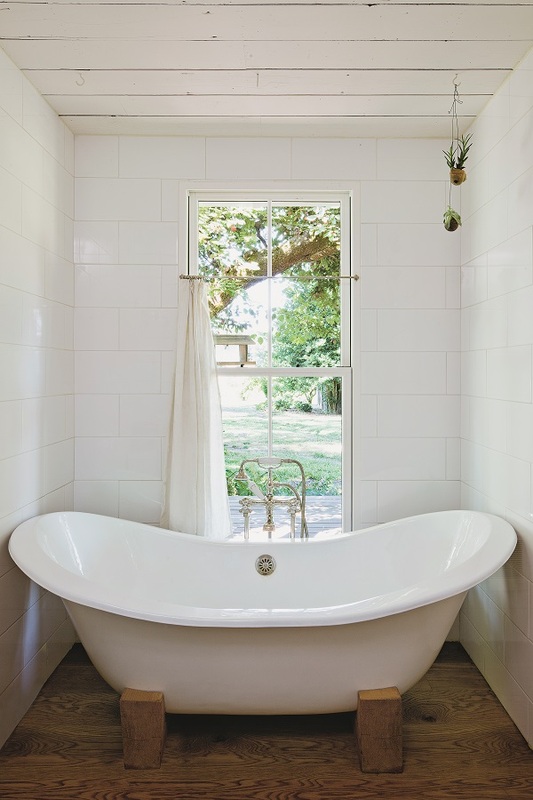 Instead, opt for a standard white that includes a hint of pink pigment for maximum ‘whiteness’ on the finished wall. Decorate (Reissue) by Holly Becker and Joanna Copestick. Extract from Secret Gardens of East Anglia by Barbara Segall, published by Frances Lincoln, an imprint of The Quarto Group. The whole of East Anglia is a rather secret, unsung place, off most people’s beaten track. I have come to know it well since I moved here in 1986, not least because my garden-writing life has taken me to gardens great and small, private and public, across the counties of Suffolk, Norfolk, Essex and Cambridgeshire. I fell instantly under the spell of this magical region and its idyllic landscapes, the spirit of which is captured so remarkably in the paintings of Thomas Gainsborough (1727-1788) and John Constable (1776-1837). The four counties have their individual charms, yet are sometimes dismissed as flat and therefore possibly a little dull. In fact, the wide horizons and huge skies, the light, the sea, the farmlands and gently undulating countryside combine to provide a rich background for garden-making. Visitors to the region can find every sort of garden inspiration here, be it bravura herbaceous borders, tongue-in-cheek topiary, sensitively sited artworks, ornamental kitchen gardens, romantic wildflower meadows or lovingly crafted detailing. East Anglia has a great tradition of creative horticulturists, whose skill and artistry in planting their own gardens resonates in many others in the region. These influential figures include the painter and iris enthusiast Sir Cedric Morris, who made a garden at Benton End, in Suffolk, after settling there in 1938; legendary nurseryman, the late Alan Bloom (founder of Blooms of Bressingham, Norfolk) and his son Adrian Bloom; and, of course, plantswoman Beth Chatto, who has shown us how to use plants that do well in particular environments. In East Anglian counties this includes summer droughts, windswept locations, dry sandy soils, or, just as problematic, clay soils that crack in summer then become muddy impasses in winter. Each garden in this book is an example not only of how to meet the physical challenges a site presents, but how to turn them to advantage. In these pages you will also find the ingenious ways in which garden owners have responded to various design challenges, ranging from tiny domestic spaces to grand, historic settings. Some have created a garden from scratch. Several have started small, then been driven by their gardening ambitions to expand into the surrounding land. Published by Frances Lincoln, an imprint of The Quarto Group. Extract taken from Nørth: How to Live Scandinavian by Brontë Aurell. Published by Aurum Press, an imprint of The Quarto Group. Sofie’s’. Third time around, you know: there is a ‘style’. ‘Scandinavian white’ or ‘Ringsted white’ or ‘Vesterbro white’, go for that. when they are up, you can’t see them. and add this to said statement chair. with pictures of bearded men. Leave them there. 10. Hide your TV, or, don’t have one. How to Live Scandinavian by Brontë Aurell. Published by Aurum Press, an imprint of The Quarto Group. Extract from At Home with Plants by Ian Drummond and Kara O’Reilly. Published by Mitchell Beazley. Even if a fireplace isn't used for its original purpose, in most living rooms it will still be the main focal point. It is also really easy to style up with plants. It it is still in use, choose heat-tolerant plants such as succulents, cacti and Tillandsia (air plants), and avoid trailing plants. Individual plants in separate pots allow you to rearrange the display at will, while a trough of complementary plants creates a simple, stylish statement. Symmetrical mantel displays can work well, as can repetitive designs, or divide the space into a series of small vignettes, introducing plants alongside ornaments. A mantle can also take one bold plant, such as Anthurium scherzerianum (flamingo flower), Zantedeschia aethiopica (calla lilly), a Dendrobium orchid or Medinilla magnifica (rose grape). Placing single plants in separate pots makes it easy to rearrange a display. Houseplants are interspersed with favourite ornaments for a more personal display. Even a narrow mantle can be used as a display surface, provided you choose small varieties of plants. For the hearth, gather together posts of tall and squat plants, such as Zamioculas zamiifolia (fern arum), Calathea makoyana (peacock plant) and Epipremnum aureum (devil's ivy). For the grate, try Zamioculcas zammiifolia as the backbone, Rhipsalis baccifera (mistletoe cactus) for trailing, plus Aglaonema 'Silver Queen' (Chinese evergreen) for foliage colour. The texture of this basket complements the plants growing inside. Extracted from Urban Flowers by Carolyn Dunster, published by Frances Lincoln, an imprint of The Quarto Group. An inexpensive way to display plants, tin cans provide good homes for annuals, which do not have large roots systems. The stars of this project are the annual lime green tobaccco plants (Nicotiana), which I grew from seed in early spring and combined with cosmos and coneflowers to produce this pretty yet inexpensive display in upcycled tin cans. The lime green hue of this variety of tobacco plant is quite stunning. It looks great in a display all by itself but to highlight its beauty I have displayed it with a tin of pale yellow cosmos and lime green coneflowers (Echinacea purpurea ‘Green Jewel’), together with cut sprigs of Bupleurum, to complete the lime zest picture. Look out for large tin cans – catering sizes are ideal and you may be able to pick them up free from a local café or restaurant. Make drainage holes in the bottom of each tin with a hammer and nail. Fill a large can almost to the top with multi-purpose compost. Gently transplant four or five seedlings into the can using a teaspoon to scoop out the roots. To avoid any damage, handle the seedlings with care. As the seedlings become established, take out all but the strongest healthiest plant to give it space to flourish and flower. If the others are growing well too, pop them in their own tin can filled with compost. It took five months from sowing to flowering, so patience is the name of the game. Water the tins every day or two, and remove faded looms to encourage more to form. You can also harvest the seed in autumn. Visit Carolyn Dunster's website Urban Flowers. Urban Flowers by Carolyn Dunster. Lise describes herself as someone who gives ‘a second life to objects’. Her studio, a room off the main living space, is filled with toys, textiles and other decorative items, creating a ‘personal universe’ which informs her work. Most people would make it look like clutter; with Lise’s expert eye, she makes it look like art. Shiny new furniture just wouldn’t fit with Lise’s work or visual aesthetic; her studio is filled with old furniture, donated by friends, bought in brocantes or found on the street, including an old canteen trestle and a rustic kitchen table. Published by Jacqui Small, an imprint of The Quarto Group. Extract from Floristry Now by Paula Pryke, published by Jacqui Small, an imprint of The Quarto Group. Garden flowers, seasonally arranged, are always in vogue. The heritage of the quintessential English garden means that our flower-arranging tradition is rich with plant material. It is no coincidence that British gardens look their best at the end of May when the Royal Horticultural Society holds the famous annual Chelsea Flower Show in London. It is one of my favourite times of the year, as late spring collides with early summer. Garden roses have been one of the areas that has seen an enormous change in the last decade. Originally garden roses were hard to get out of season but over time countries such as Kenya in Africa and Colombia in South America have invested in a lot of garden rose production. Many are the famous roses of the breeder David Austin, and the company have also invested more recently in cut-flower production alongside their plant-growing activities. A pastel watering can is crammed with a selection of spring flowers, including arching Solomon’s seal, magnolia buds, lilac, ‘Antique’carnations, eryngium, rosebuds and Viburnum opulus. This fine-looking Stachys byzantina is tied to a metal basket with raffia. Floral foam holds ‘Miss Delilah’ phlox, ‘Figaro Lavender’ stocks and purple summer asters. Stems of handsome leafless Solomon’s seal are then drawn across the design to show off their creamy white bells to maximum effect. It is very fashionable to have collections of vases together, with small arrangements or even single stems in each. This makes the maximum impact out of the fewest flowers, so is perfect for making the most of garden pickings. Sprigs of flowering currant, forsythia, viburnum blossom, primroses, hellebores and dicentra sit in tiny irregular vases. I love the shape of this enamel jug which, when filled, has a wide enough mouth to create a good spread of flowers. Here it holds Alchemilla mollis, Consolida ajacis, rose-coloured eustoma, two-tone antirrhinum and the wonderful scented garden rose Evelyn. Floristry Now by Paula Pryke. Extract from She Sheds: A Room of Your Own by Erika Kotite. Published by Cool Springs Press, an imprint of The Quarto Group. Ken Smith designed a more steeply pitched roof and included a small oval window and French doors. Two custom-made barn lights in deep cobalt blue complete the facade. There are times when a she shed doesn’t start out that way. Susan Mintun, a noted former horticulturist and now a botanical illustrator, knew her tools were losing the battle for garage space with her husband’s many automobiles. Nevertheless, she wanted something pretty that reflected the French architecture of her Main Line, Pennsylvania, home. A moveable ladder provides easy access to the loft storage area. Mintun contacted Ken Smith of Garden Sheds Inc. and asked if he could modify the company’s colonial style shed to meet her needs. The result is both restrained and stylized. “I wanted the ‘presence’ of a functional structure as part of my garden’s design,” Mintun recalls. What she didn’t expect was how much she would enjoy being in her new shed. Mintun began using it as a satellite studio to work on her illustrations. She uses an old butcherblock table and sketches away with a view to the flowers in her garden. “If I had known how much I would love this shed, I would have included a sink and maybe insulation so that I could use it year round,” Mintun says. The interior is unfinished, featuring an unpainted cedar floor and one bracketed shelf where Mintun has her collection of birdhouses. French Accents: Mintun loves the light that streams in through the French doors, four matching windows, and oval window overhead. Copper roof finial, custom made for her shed. Mintun curated plant collections and taught horticulture in St Louis before retiring and moving to Pennsylvania. She Sheds: A Room of Your Own by Erika Kotite. Published by Cool Springs Press, an imprint of The Quarto Group (£16.99). Have you dreamed of a quiet place where you can get away from it all? Do you have a creative spirit that is searching for somewhere to thrive? Would you like to surround yourself with special things that are yours and yours alone? Do you believe that the best things come in small packages? All over the world, others have felt the same desires and discovered the solitude and splendor of a she shed. They may be described by other names, such as hen hut or lady lair, but the purpose and benefits are exactly the same. 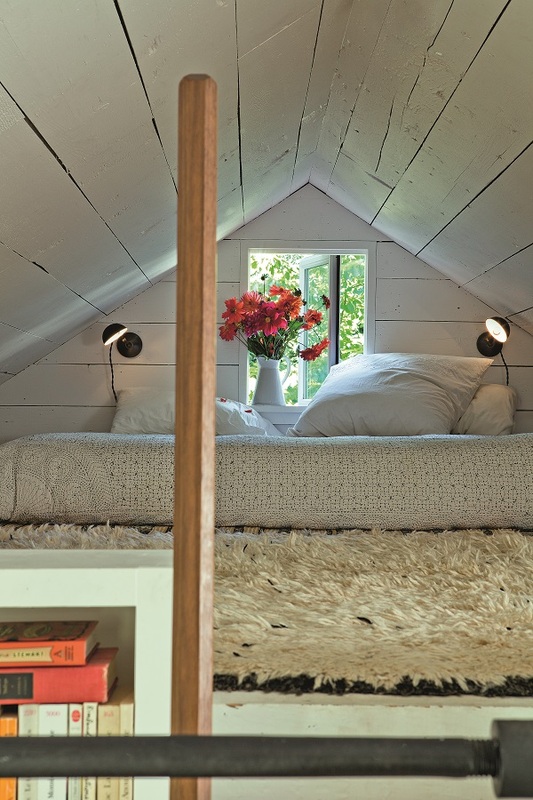 In She Sheds, the beautiful new book by Erika Kotite, you’ll see dozens of in-depth examples of these private spaces to inspire you in your own pursuit. Some she sheds are dedicated to making art or music, some to gardening, writing, or reading. The activities are as varied as the women who have created them. But they all share one thing in common: they began as someone’s dream and blossomed into a small slice of heaven. Erika Kotite is an editor, writer, and content developer in both print and digital media. She was editor-in-chief of Romantic Homes and Victorian Homes for many years, bringing that experience to producing books for Sterling, Quarry, and Walter Foster. Some of her titles include, Felt Fashion: Couture Projects from Apparel to Accessories, Blogging for Bliss, and The Daily Book of Photography. She Sheds: A Room Of Your Own by Erika Kotite is published by Cool Springs Press (£16.99). The book officially releases on 16th February and more information can be found here.